Context: Despite being the most common cause of cranial dystonia, Meige's syndrome remains a rare clinical entity. Characterized by blepharospasm and orofacial dystonia, patients suffering from Meige's syndrome benefit from the injection of botulinum toxin (BTX). Aims: As the majority of the studies tend to discuss Meige's syndrome with blepharospasm patients, there is a paucity of case-based studies dealing exclusively with this syndrome. Hence, we intended to characterize and define the evolution of this syndrome and objectively determine the response of the patients suffering from this entity to BTX therapy. Materials and Methods: Eight patients with Meige's syndrome who had never been injected with BTX in the past were evaluated at our movement disorder clinic using a structured questionnaire. Videotaping of abnormal movements was done for 5 minutes before the BTX injection and at a 1-month follow-up. All patients received electromyography-guided injection of BTX and the dosage was decided using clinical evaluation. Their demography, clinical features, and treatment response to BTX were analyzed using the “Burke–Fahn–Marsden dystonia rating scale” (BFMDRS) before injection and at a 1-month follow-up. Results: The peak age of symptom onset was 46.4 years with a male: female ratio of 1:1. The average duration of symptoms was 6.43 years. Majority of the patients (6/8) manifested their disease with blepharospasm, including five patients who had clonic blepharospasm. Lingual dystonia (6/8) and pharyngeal involvement (4/8) were commonly noted. Sensory tricks were present in all, with placement of the fingers over eyelids being the commonest trick (7/8). The average BTX dose administered was 51.58 units, and the peak onset of relief was noted at 8.62 days after the injection. The duration of the effect lasted for 82.5 days on an average. Only one patient reported mild weakness of the muscles of mastication following BTX injection. The average BFMDRS improved from the preprocedural score of 25.06 to 13.12 following the BTX injection. Conclusions: In this series exclusively dealing with Meige's syndrome patients, tongue involvement was found to be very common (6/8, 75%), and the response to the first dose of BTX treatment was found to be excellent without the occurrence of any major side effects. In patients with Meige′s syndrome with the characteristic manifestations of blepharospasm and orofacial dystonia (including lingual dystonia and pharyngeal involvement), the injection of botulinum toxin was very effective in alleviating the disease symptomatology. The initial descriptions of Meige's syndrome date back to the 16th century when the typical symptoms were considered to be hysterical or psychiatric in origin. However, following the reports of Dr Henri Meige in 1910, and further elaboration by Dr David Marsden later, more insight was gained into this rare disorder. Meige's syndrome is a constellation of symptoms comprising blepharospasm, oromandibular dystonia (OMD), and occasionally cervical dystonia. The current favored terminology for this syndrome is segmental craniocervical dystonia. The syndrome manifests most commonly between the 5th and 7th decades, occurring more frequently among females. The onset of symptoms is typically with blepharospasm with eventual spread to involve the lower half of the face resulting in OMD. Cervical dystonia is considered to be the most common feature of extracranial spread of the symptoms. It is largely considered to be a sporadic disorder although a few studies have indicated that it could have a genetic basis. There have been several case series published in the literature on blepharospasm and less so on OMD; however, very few studies have exclusively described the various features of Meige's syndrome, including its response to treatment with botulinum toxin (BTX). We conducted this study to understand the pattern of evolution of the symptoms, as well as the response of these patients to BTX treatment. We recruited 8 consecutive patients presenting with Meige's syndrome from our movement disorder clinic over a period of 18 months who never received BTX injection in the past. These patients underwent a detailed clinical evaluation of their symptoms that included demographic characteristics, duration and evolution of the symptoms, any risk factors, and other associated findings. All the patients underwent electromyography-guided (myoject, Nicolet) injection of BTX (Onabotulinum toxin A), and the response was measured objectively using the “Burke–Fahn–Marsden dystonia rating scale” (BFMDRS) at 1 month. A 50-year old housewife presented with symptoms of involuntary closure of her eyelids for 1 year with involuntary pursing of the lips. This was associated with the contraction of muscles over anterior aspect of the neck for a month. She gave no prior history of craniofacial or neck injury or any previous dental procedures. She was a tobacco chewer. On examination, she had severe tonic blepharospasm, rendering her functionally blind. Simultaneously, the patient exhibited dystonia affecting her lower face and the platysma muscle. The manifestations included persistent lip pursing and lingual dystonia. During examination, she kept placing her hands over the forehead to open her eyes. She has shown remarkable improvement with BTX, and her BFMDRS score decreased from 24 to 12 in a month's time. A 51-year old female patient presented with a history of involuntary eye closure for 7 years and abnormal facial movements for 3 years. She had to constantly place her hands on the forehead, especially while walking, in order to keep the eyes open. She also had to perform repeated random placements of her hands on her face, apparently to get relief from the symptoms. Clinical examination revealed tonic blepharospasm, lower facial involvement with lip pursing, jaw opening and closing, with bruxism, grimacing, lingual dystonia, pharyngeal involvement, and retrocollis. She also showed a remarkable improvement with BTX injection with a reduction of the BFMDRS score from 29 to 14 in a month's time. A 22-year old young girl presented with a 5-year history of involuntary contractions of the angle of the mouth (more on right side) with grimacing and constant jaw opening, which was soon followed by clonic blepharospasm. She also used to constantly place her fingers over her face and rub her eyes as sensory trick movements. She also significantly improved on the BFMDRS score, evaluated at a month's time after the BTX injection (the BFMDRS score changed from 29 to 11 in a month's time). A 37 year old lady presented with symptoms of involuntary closure of the eyelids of relatively short duration (6 months) followed by oro-mandibular dystonia for 6 weeks. She had a significant history of consuming sedatives for 3 years prior to the onset of her symptoms. To relieve her symptoms, she would chew gum and cover her mouth with her hands. On examination, she had blepharospasm and severe orofacial dystonia, with markedly prominent grimacing, jaw clenching, and bruxism with involvement of the platysma. The patient's brother had a history of essential tremors of 5-year duration. She received an injection of BTX once for the blepharospam, to which she responded well; however, her orofacial symptoms started emerging after the injection which reflected in the worsened post-injection phase. Her BFMDRS score increased from 8.5 to 10. A 58-year old male patient, a past tobacco chewer, presented with a one-year history of difficulty in speaking. His speech appeared strangled and was associated with involuntary grunting sounds. He also had difficulty in swallowing with repeated choking episodes and involuntary pulling of the angle of mouth with contraction of the anterior aspect of neck. This was followed in 3 months by involuntary closure of eyelids suggesting the presence of blepharospasm. The patient would constantly rub his hands over his face, especially around the mouth and neck. On examination, he had severe blepharospasm associated with severe platysmal contraction and orofacial dystonia with lip pursing, blowing out of cheeks, and grimacing. He had severe bruxism, spasmodic dysphonia (adductor), lingual dystonia, and pharyngeal dystonia with repeated contractions of his soft palate and uvula retraction. The patients showed improvement in his ability to speak and swallow following the BTX injection with improvement in the BFMDRS score (which changed from from 32 to 19). A 74-year old gentleman presented with involuntary closure of eyelids, especially in the sunlight, for 5 years. During the past 8 months, he had developed disabling symptoms of repeated involuntary tongue protrusion along with mouth opening and repeated involuntary swallowing movements, which were interfering with his ability to eat. He was on sedatives (alprazolam) for 6 years prior to the onset of his symptoms. He also had a history of essential tremors since his teenage years. He was making repeated attempts to keep his eyes open using his hands to pull on his eyelids. On examination, he had blepharospasm along with contraction of the platysma, and severe orofacial dystonia with repeated tongue protrusions, especially on attempts at talking, as well as visible movements of the throat. His BFMDRS score showed a remarkable improvement from 22 to 7 with an injection of BTX. A 49-year old man presented with a 7-year history of forceful eye closure followed by involuntary retraction of the angle of mouth. This was accompanied by forceful closure of the jaws resulting in repeated tongue bites, especially on eating food, and contraction of the anterior aspect of neck since the last 3 years. He would often try to stabilize his chin with his hands in order to decrease the symptoms of OMD. On examination, he had clonic blepharospasm and OMD with bruxism and prominent lingual dystonia and platysmal contraction. With BTX, he found relief in his symptoms (the BFMDRS score improved from 20 to 14). An elderly woman, 72 years of age, presented with a long-standing (24 years) history of involuntary forceful eye closure. However, for the past 4 years, she had started developing involuntary retraction of the angle of mouth with lip pursing and jaw closure as well as repeated tongue bites, especially on eating, and difficulty in speaking with a strangled speech. Prior to the onset of blepharospasm, she had developed blepharitis, which lasted for nearly 6 months. On examination, she had blepharospasm, platysmal contraction, prominent retrocollis, and severe OMD with lip pursing, grimacing, bruxism, pharyngeal movements, and lingual dystonia. The patient's BFMDRS prior to the administration of BTX injection was 36, and after she received BTX, the score improved to 18, with blepharospasm and retrocollis showing a good response. A series of 8 successive cases of Meige's syndrome comprising an equal number of male and female (male: female ratio 1:1) patients, with a mean age of 51.62 years (range: 22–74 years) were included [Table 1] and [Table 2]. The peak age of symptom onset was in the 5th decade (4 cases), with the average age being 46.4 years. In our series, the earliest age of documented onset was 17 years. The mean duration of symptoms was 6.43 years (range: 6 months to 24 years). Blepharospasm was the initial presenting complaint in 6 out of 8 cases, with the other two patients presenting with OMD and spasmodic dysphonia. The average duration of blepharospasm before the onset of OMD was 188.5 months (29.5 months, if the patient with a long duration of symptom is excluded). All patients eventually developed both blepharospasm and OMD. None of the patients, except one, reported a preceding history of trauma. In the one patient who had a previous history of trauma, the episode of trauma, however, was temporally unrelated to the onset of OMD. One patient had a history of blepharitis, which lasted for several months, prior to the onset of blepharospasm. A history of drug intake (sedatives) was present in 2 patients, 3 and 6 years before the onset of symptoms. Blepharospasm was bilateral from the onset in all cases, and in 2 patients, the symptoms were severe enough to render them functionally blind. Only one patient had photophobia associated with blepharospasm, and none of the patients reported any preceding history of increased frequency of blinking. When analyzed for the type of blepharospasm, 3 patients were found to have the tonic type of spasms, and the remaining 5 patients had clonic spasms. Lower face involvement was seen in the form of lip pursing (6/8) and chewing (3/8) movements. Jaw involvement was seen in 6 cases, with 4 cases having jaw closure dystonia and 2 cases having both jaw closing and opening dystonia. Two of the patients with jaw closure dystonia also reported sustaining repeated tongue bites because of forceful jaw closure. None of the patients had jaw-thrusting dystonia. All patients had repeated grimacing as a part of the OMD. Lingual dystonia was noted in 6 out of 8 patients. Pharyngeal involvement in the form of repeated contractions of the oropharynx was seen in 4 patients; however, only 1 patient reported difficulty in swallowing with repeated choking spells. Involuntary contraction of the anterior aspect of neck (platysma) was seen in half the cases (4/8). Two patients developed spasmodic dysphonia during the course of their illness. It was early and severe in one of them, leading to strangled speech and production of involuntary sounds. Two patients had evidence of respiratory involvement in the form of repeated inspiratory and expiratory stridors. Two patients had cervical dystonia (retrocollis). Sensory tricks were noticed in all the recruited patients. The most common sensory trick was the placement of the fingers over the eyes or making an attempt to forcefully pull the upper eyelids (7/8). The other sensory tricks were placing the hands over the lower half of the face, especially the mouth (5/8), supporting the chin on one's hands (1/8), placing fingers over teeth (1/8), and chewing gum (1/8). The comorbidities included hypertension (2/8), diabetes mellitus (2/8), and hypothyroidism (1/8). One patient had a history of hand tremors (action tremors), which were present even before the onset of current symptoms. A family history of essential tremors was seen in another patient. All except 2 patients received medical treatment prior to being given BTX. The average BTX dose given was 51.58 units. All patients received the injection of BTX for eyelid spasm. Other muscles injected in decreasing order were the intrinsic tongue muscles, masseter, temporalis, and lateral pterygoids. The average time to the peak onset of relief with BTX injections was 8.62 days with the duration of benefit lasting for an average of 82.5 days. Following BTX injections for blepharospasm, a patient reported development of OMD which was previously not present, while another patient experienced worsening of pre-existing symptoms of OMD. Only one patient reported weakness of jaw closure after BTX was injected into the masseters. There was objective improvement in the symptomatology, as evidenced by improvement in the average BFMDRS score from the pre-BTX score of 25.06 to the score of 13.12 following the treatment. We enrolled 8 consecutive patients of Meige's syndrome presenting to our clinic for this study. Previous studies have indicated that Meige's syndrome occurs more commonly among women compared to men with the women to men ratio being 2:1.,,, Our series, however, showed no particular gender predilection. The peak age of onset was the fifth decade in our case series, which was similar to that reported in the previously published studies; however, there were 2 patients who had onset of symptoms at a much younger age, which has been reported rarely., Meige's syndrome presents with blepharospasm as the initial symptom, which is also its most debilitating symptom. Six out of 8 of our patients presented with blepharospasm as the first symptom. An onset of the symptoms in the oromandibular region is considered to be rare; however, we documented a patient who had an initial onset of symptoms of OMD and then progressed to have blepharospasm. Five out of 8 patients had spread of symptoms from the orbicularis oculi to involve the lower facial muscles within 3 years of onset of blepharospasm, as has been suggested by Abbruzzese et al. Trauma is an important risk factor for the development of focal dystonias, including Meige's syndrome; however, we found no such correlation in our patients. Although a preceding history of eye disease has been implicated in the development of blepharospasm, it was found in only 1 patient in our series. While certain studies have suggested that focal dystonias have a genetic basis, none of our patients reported a significant family history, suggesting the sporadic nature of the illness in our patient cohort., The onset of blepharospasm was bilateral in all of our patients. Although an increased frequency of blinking prior to the onset of blepharospasm has been observed in a large majority of the patients in a previous study, none of our patients reported this symptom. The tonic form of blepharospasm is known to be more common than the clonic form; however, our patients displayed a completely opposite picture. Lingual dystonia, considered to be rare in Meige's syndrome, was present in the majority (6 out of 8) of our patients. The possible reason for this could be that it was not very well appreciated in the previous studies, and the manifestation seems to be far commoner than was previously thought. It is important to recognize lingual dystonia because it may have a favorable response to BTX, as was appreciated in our series. The most commonly reported extracranial site of spread of symptoms is to the cervical muscles, with 2 of our patients having cervical dystonia (retrocollis). Spasmodic dysphagia as well as spasmodic dysphonia have also been reported to be constituents of Meige's syndrome, as was seen in our series in cases 1 and 2, respectively. Jankovic et al., reported action hand tremors to be a common extracranial manifestation of Meige's syndrome, though it was seen in only one of our patients. Sensory tricks are seen commonly in Meige's syndrome, as in other focal dystonias, and it was noted in all of our patients. The most common ones were placing fingers over the eyelids or lower face, or placing various objects in the mouth. All our patients received onabotulinum toxin A injections, the current treatment of choice, with 6 patients reporting unsatisfactory results with oral medications [Table 3]. The average BTX dose received by our patients was 51.58 units per sitting per patient which was in line with the two previous studies, where the dose ranged from 30–60 units., Mauriello et al., reported the average number of botulinum toxin injections to obtain a response to be 5; however, most of our patients showed a good response after the first sitting itself. The reason for this earlier response could be because of the improved technique of injection administration as well as a better understanding of the usage of BTX. The peak effect of BTX was noticed within 7 days (range: 4–15 days). The average duration of relief in symptoms was 11.5 weeks in our study, which was similar to the previously reported series (range: 9–16 weeks).,,,, Interestingly, two of our patients remained symptom free for nearly a year after the last dose. The spread of symptoms beyond orbicularis oculi was seen in only one patient following BTX injection for blepharospasm. This could be coincidental and may only indicate a natural evolution of the symptoms of this syndrome. The response rate to BTX in our series was consistently good, as has been reported for essential blepharospasm. Symptoms of blepharospasm improved satisfactorily in our patients with other components (OMD, cervical, and lingual dystonia) of Meige's syndrome also responding favorably. None of our patients developed any local eyelid complications, except a patient who noticed mild jaw weakness following BTX injection into the masseter muscles. BFMDRS were recorded in all patients, both prior to as well as following BTX injection, with a consistent improvement in symptoms. However, other series have not made an objective recording of improvement in symptoms following treatment with BTX. Meige's syndrome appears to be a sporadic disorder, affecting male as frequently as female patients. Though the most common presenting symptom is blepharospasm, lingual involvement is not as rare as has been previously reported. The response to BTX in Meige's syndrome is efficacious, consistent, well-sustained, and is associated with minimal complications. Abbruzzese G, Berardelli A, Girlanda P, Marchese R, Martino D, Morgante F, et al. Long-term assessment of the risk of spread in primary late-onset focal dystonia. J Neurol Neurosurg Psychiatry 2008;79:392-6. Defazio G, Berardelli A, Abbruzzese G, Coviello V, Carella F, De Berardinis MT, et al. Risk factors for spread of primary adult onset blepharospasm: A multicentre investigation of the Italian movement disorders study group. J Neurol Neurosurg Psychiatry 1999;67:613-9. Jankovic J, Orman J. Blepharospasm: Demographic and clinical survey of 250 patients. Ann Ophthalmol 1984;16:371-6. Martinez-Ramirez D, Giugni JC, Hastings E, Shukla AW, Malaty IA, Okun MS, Rodriguez RL. Comparable BTX outcomes between primary and secondary blepharospasm: A retrospective analysis. Tremor Other Hyperkinet Mov 2014;4:286. Tolosa E, Martí MJ. Blepharospasm-OMD syndrome (Meige's syndrome): Clinical aspects. Adv Neurol 1988;49:73-84. Tolosa ES. 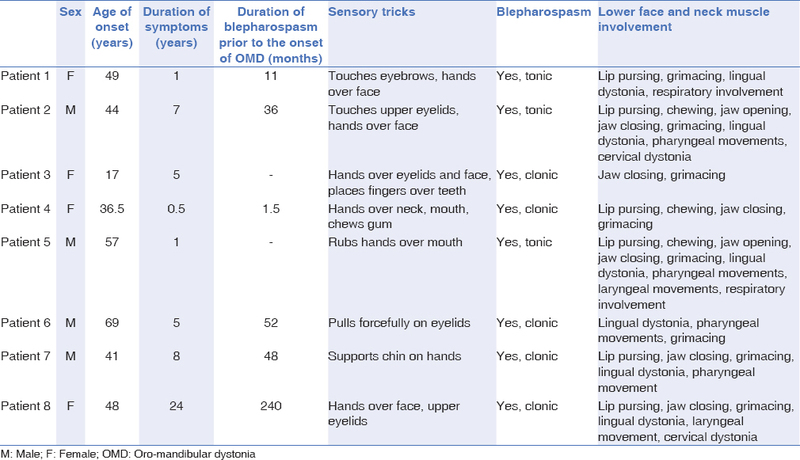 Clinical features of Meige's disease (idiopathic orofacial dystonia): A report of 17 cases. Arch Neurol 1981;38:147-51. Jankovic J, Ford J. Blepharospasm and orofacial-cervical dystonia: Clinical and pharmacological findings in 100 patients. Ann Neurol 1983;13:402-1. Peckham EL, Lopez G, Shamim EA, Richardson SP, Sanku S, Malkani R, et al. Clinical features of patients with blepharospasm: A report of 240 patients. Eur J Neurol 2011;18:382-6. Defazio, G., Livrea, P. Epidemiology of primary blepharospasm. Mov Disord 2002;17:7-12. Defazio G, Martino D, Aniello MS, Masi G, Abbruzzese G, Lamberti S, et al. A family study on primary blepharospasm. J Neurol Neurosurg Psychiatry 2006;77:252-4. Simpson DM, Naumann M, Blitzer A, Comella CL, Green MW, Gronseth GS, et al. Practice parameter: Botulinum neurotoxin for the treatment of movement disorders and spasticity: An evidence-based report of the Therapeutics and Technology Assessment Sub committee of the American Academy of Neurology. Neurology 2008;70:1699-706. Poungvarin N, Devahastin V, Chaisevikul R, Prayoonwiwat N, Viriyavejakul A. Botulinum A toxin treatment for blepharospasm and Meige's syndrome: Report of 100 patients. J Med Assoc Thai 1997;80:1-8. Hwang WJ. Demographic and clinical features of patients with blepharospasm in Southern Taiwan: A university hospital-based study. Acta Neurol Taiwan 2012;21:108-14. Mauriello JA, Dhillon S, Leone T, Pakeman B, Mostafavi R, Yepez MC. Treatment selections of 239 patients with blepharospasm and Meige's syndrome over 11 years. Br J Ophthalmol 1996;80:1073-6. Elston JS, Marsden CD, Grandas F, Quinn NP. The significance of ophthalmological symptoms in idiopathic blepharospasm. Eye 1988;2:435-9.